The call came early this morning. As much as you attempt to prepare, you always convince yourself that there will be more time. 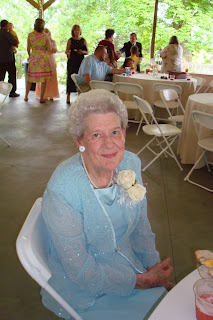 This morning, we lost my wife's grandmother. She moved here to town with my wife's parents a couple of years ago and though watching her decline over the last few months has been quite rough for us all, we were so fortunate to have the time to be so close. I am deeply grateful that our children got to be around their great-grandmother in the same manner that I grew up with mine. Selfishly, we hate to let go of someone who we love and who has meant so much to us but we celebrate the many great things she accomplished in her life and she has left us many wonderful memories and a true example of faith and strength. 1 For we know that if our earthly house, this tent, is destroyed, we have a building from God, a house not made with hands, eternal in the heavens. 2 For in this we groan, earnestly desiring to be clothed with our habitation which is from heaven, 3 if indeed, having been clothed, we shall not be found naked. 4 For we who are in this tent groan, being burdened, not because we want to be unclothed, but further clothed, that mortality may be swallowed up by life. 5 Now He who has prepared us for this very thing is God, who also has given us the Spirit as a guarantee. 6 So we are always confident, knowing that while we are at home in the body we are absent from the Lord. 7 For we walk by faith, not by sight. 8 We are confident, yes, well pleased rather to be absent from the body and to be present with the Lord. I want to get FAT!